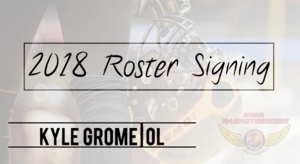 DES MOINES – The Iowa Barnstormers have signed offensive lineman Kyle Grome to the 2018 roster, Head Coach Dixie Wooten announced today. Grome (6-3, 315, Trinity International University) joins the Iowa Barnstormers for his first season with the team. Grome made his IFL debut last season, appearing in 7 games with the Cedar Rapids Titans. Collegiately, Grome attended Trinity International University where he played for four years, appearing in 33 total games. In his senior season, Grome earned NCCAA All-American First Team and All-MSFA Midwest League Second Team honors. Season Tickets for the Iowa Barnstormers 2018 season are available now! For as low as $80 per seat, fans can enjoy the action from the same great seat location each game. For more information, call the Barnstormers at (515) 633-2255 or log on to www.theiowabarnstormers.com.